The new municipal fueling station on Mt Lucas Road in Princeton. It was built without any consultation of neighbors. (click to expand). Laurel Road residents attended the Princeton Council meeting last Monday to express fury at the unexpected construction of a new gas station at the bottom of Mt Lucas Road. The gas station – which is in a residential R-6 zone – was built without any public consultation. Many neighbors only found out about it when a construction crew appeared in February to start building. It replaces a grassy area where trees had grown and where sculptures were on display. The residents were also angry that the town was closing part of Terhune Road without having any alternative circulation plan in place. The gas station is intended for fueling of municipal vehicles including police cars and school buses. Previously, a much more low-key fueling depot had existed on the adjacent plot of land. The fueling station could not remain at that site, because the town promised the land to the Princeton First Aid and Rescue Service (PFARS) for construction of a new ambulance station. 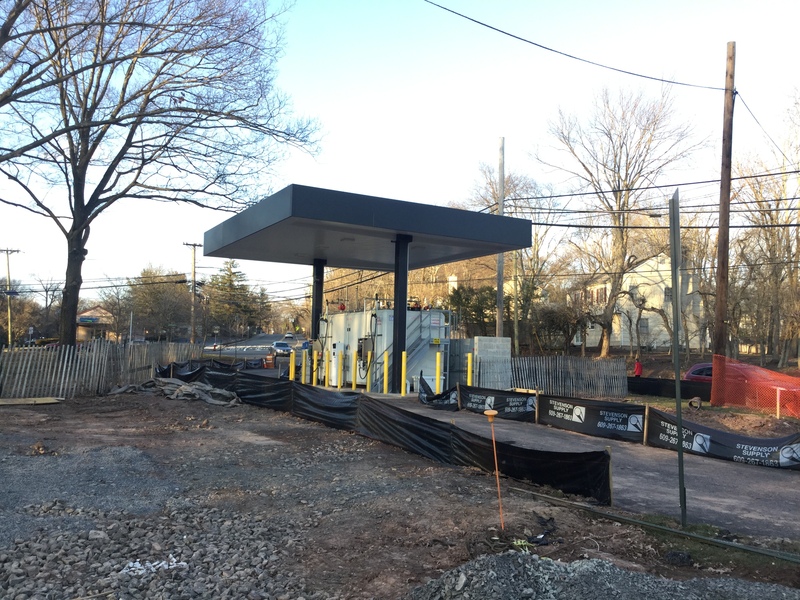 In February 2018, the new PFARS station was approved by the Princeton Zoning Board. The site plan was published on Walkable Princeton in January of that year, when it was under review. Notably, the plan did not include any fueling station, and the Zoning Board heard testimony that the fueling station was not part of the PFARS application. There has been no public examination of plans for the fueling station at any time, even though neighbors requested plans, and a gas station is not a permitted use. During the Zoning Board hearing in February 2018, neighbors expressed concerns that there was inadequate planning for traffic circulation around the new PFARS station. Part of Terhune Road was closed to allow construction of a parking lot for the ambulance station. As forewarned, traffic back-ups have proven to be a big problem for neighbors. Dana Molina of Laurel Road said she could not drive her son to school because of the gridlock, adding “It was already a mess, and now it’s even more of a mess”. The town is working on preparing a traffic study to address the problems with traffic merging from the neighborhood onto Route 206, but improvements are unlikely for many months. Although the neighbors in the local area had accepted the new PFARS ambulance station, the mis-managed circulation plan and sudden construction of a full-size gas station drew angry complaints. Ms. Molina described the replacement of trees and shrubs with a gas station as “a crime”, and demanded a neighborhood meeting to find out what was going on. Another Laurel Road resident decried the “total lack of transparency” regarding the public consultation, and contrasted the elaborate concern that the town pays to other construction projects with the clandestine planning for the new gas station. Residents wanted to know whether alternative sites for the gas station had been considered, but nobody on Council seemed to know anything about it. Instead the Mayor half-promised a neighborhood meeting, if they could ‘figure out’ how it could be a ‘productive’ meeting. 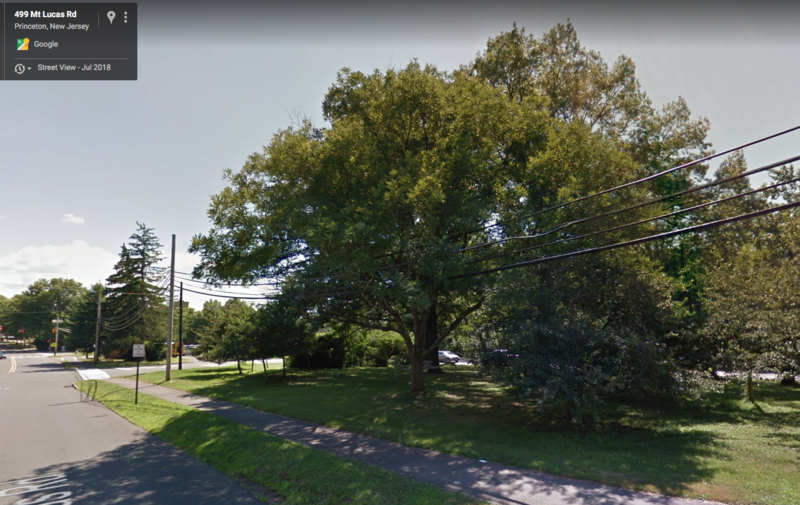 Setting aside the residents’ traffic concerns, Council voted unanimously to introduce an ordinance to abandon the public right-of-way on Terhune Road between Route 206 and Witherspoon Street. The full public hearing will take place on March 25. If passed, the ordinance will finally formalize the closure of this section of Terhune Road, several months after the closure happened. It is still not clear what the final site plan is for the fueling station area, or whether any consideration has been given to pedestrians. The new gas station will require two new curb-cuts through the existing sidepath, and it appears that there are no improvements for people walking from the Terhune Road neighborhood toward the open spaces in Community Park North, on the other side of Route 206. *Update 3.20.2019: The neighbors have a letter to the editor in this week’s ‘Town Topics’ discussing their objections. Read it here. This entry was posted in architecture, Complete Streets, planning, Princeton, Traffic, Zoning and tagged planning, Princeton, trails, Zoning. Bookmark the permalink.